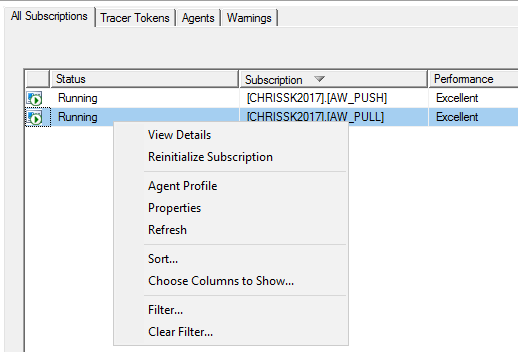 Here is a quick ReplTip on difference in SQL Management Studio and Replication Monitor for Push v. Pull Subscriptions. For PULL subscribers you must connect via SSMS or Remote Desktop (RDP) connection to the Subscriber to performance administrative tasks like starting, stopping, or changing parameters. The icon changes to show tiny “computer” on the PULL subscriber as reminder. For SQL Server Agent, the PULL job name will include GUID to ensure uniqueness. What difference do you see with PULL subscriptions in Replication Monitor? Notice the ability to STOP and START the PULL subscribers is missing from the Replication Monitor dialogs. Again, to manage the PULL subscribers connect to the individual subscribers. Not a problem for 1 subscriber, a headache with 20 or 30 subscribers. As number publishers, publications, subscribers grow, consider an independent SQL Server for your Distributor role running local Log Reader agents PULLING down changes from Publishers and Distribution Agent PUSHING changes to subscribers. As the total number of running Replication Agents approaches 100, consider increasing the Windows Desktop Heap size.